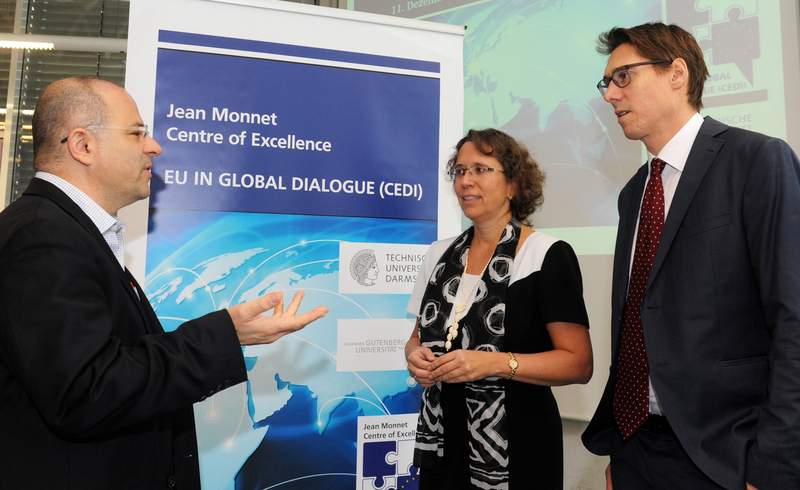 The newly established Jean Monnet Centre of Excellence "EU in Global Dialogue" (CEDI) is a joint project of Technische Universität Darmstadt and Johannes Gutenberg University Mainz (JGU) and will focus on research and teaching as well as knowledge transfer and networking relating to the international relations of the EU. The European Commission is to provide the financing for the Jean Monnet Centre of Excellence (JMCE), which will bring together the expertise of the two Rhine-Main Universities in Mainz and Darmstadt on EU-related topics in order to generate and promote synergies between the various specialist disciplines and resources in the field of European Studies. In addition, the JMCE is designed to make an important contribution to informing the public on aspects concerning the EU and to provide a forum through which the related subjects can be critically examined. The emphasis of the three-year JMCE program at the universities of Mainz and Darmstadt will be on research and teaching relating to the "EU in Global Dialogue". Among the subjects to be scrutinized are the foreign policy implications of EU immigration policy and regional integration from a comparative perspective. With regard to teaching, the new center will make possible the continuation and development of the innovative teaching methods employed at Mainz University in terms of EU-related simulations such as the Model European Union Mainz (MEUM) and the role-playing game EU+, which is designed for high school pupils. The Jean Monnet Centre of Excellence "EU in Global Dialogue", which bears the name of the pioneer of European unification, is part of the newly founded strategic alliance of the Rhine-Main Universities in Frankfurt, Mainz, and Darmstadt. As outstanding research universities in the Rhine-Main area, Goethe University Frankfurt, Johannes Gutenberg University Mainz, and Technische Universität Darmstadt have come together to form the strategic RHINE-MAIN UNIVERSITIES alliance. In December 2015, they signed a framework agreement to provide for even closer cooperation. The alliance partners with their about 110,000 students and 1,440 professors aim at extending and permanently securing their existing collaborations in the fields of research, teaching, continuing academic education, and the promotion and mentoring of young researchers. The trilateral agreement merges the particular strengths of the three universities, consolidates and enhances their complementary profiles, and expands the course offerings for their students. Already interlinked by more than 70 joint projects and discipline-specific networks, the Rhine-Main Universities represent and support the continuous development of the whole Rhine-Main research hub and improve its international visibility and attractiveness across a broad spectrum of disciplines – from Medicine and the Natural Sciences to the Humanities and the Social Sciences to Engineering.